We are starting to see rhubarb in the supermarkets, rhubarb tarts lining the patisserie shelves, which for me means spring is on the way. This beautiful, brightly coloured vegetable is in season, well the ‘forced’ variety. Until the early 19th century rhubarb was only grown outdoors and harvested from late spring through until early autumn. Forced rhubarb is the result of a ‘fortunate’ accident in the Chelsea Physics Garden in 1817, where a number of rhubarb roots were accidently covered with soil by workmen digging a trench. Weeks later, when the soil was removed, were tiny tender pink shoots of rhubarb. 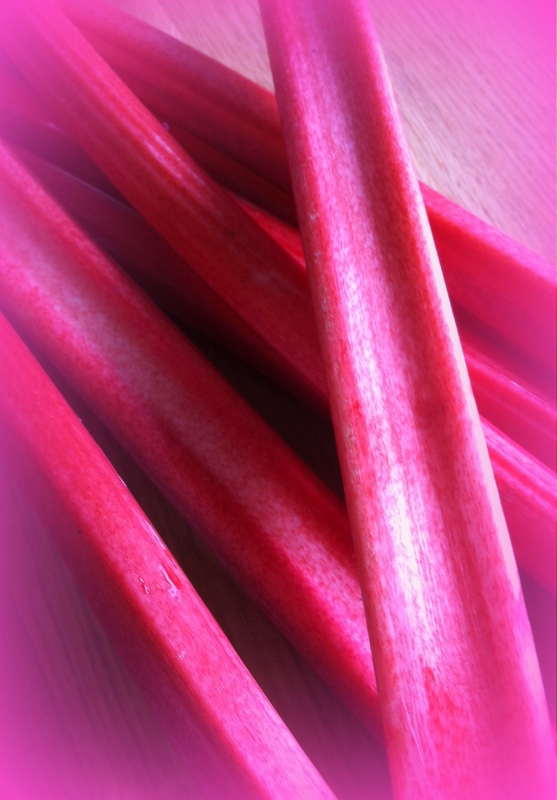 Forced rhubarb has a less astringent and more delicate flavour and can be cooked with less sugar than the spring summer crop. Nor does it need to be peeled, the leaves however, of either harvest, are toxic. 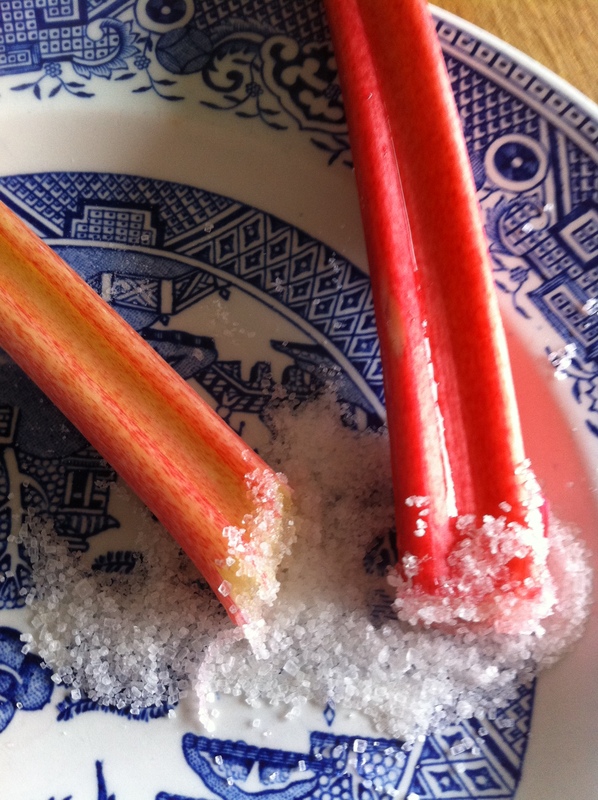 My childhood memory of rhubarb is walking around the garden with a freshly plucked stalk, probably rinsed as it helps the sugar stick for that first bite, and dipping it in a saucer of sugar before each bite. Yum. Some of the best recipes for rhubarb are of course desserts, but this vegetable is so versatile. It can be stewed, roasted, baked or boiled. Either in a stodgy pudding or a sophisticated jelly, it balances nicely with fatty or rich meats and oily fish. It makes a delicious jam or a hot spicy chutney or relish. It can be turned from vegetable to wine, or add a blush to vodka. So it is no wonder that in recent years rhubarb has enjoyed increased popularity on menus in top restaurants. To avoid the rhubarb turning to mush when cooking, bake it in the oven. Pack the cut rhubarb in an ovenproof dish in a single layer, sprinkle with sugar to taste, (try a raw piece to see how much sugar to add, well that is my excuse) add a little liquid (splash of water, orange juice, sweet wine), cover tightly and cook for about 15-20 minutes at 180°c/fan160°C. Leave to cool and firm up before using. It pairs fantastically with apples, pears, strawberries or ginger, lemon grass, orange flower water or rosewater. And a little pot of stewed rhubarb served with pork, mackerel, duck or goose is easily made. A simple rhubarb and warm custard is one of those magical combinations. So much so that in the UK it even had a cult children’s TV series named after it in the 70’s. The theme being the loving rivalry between Roobarb the green dog and Custard the pink cat from next door. Cut the rhubarb into 2” pieces and place in an ovenproof dish, sprinkle with the water and sugar and roast in the oven for 10 minutes. Rub the butter into the flour and sugar to make the crumble topping gently using the tips of your fingers. Remove the rhubarb from the oven and sprinkle over the crumble and bake in the oven for 35-45 minutes or until the topping is golden. 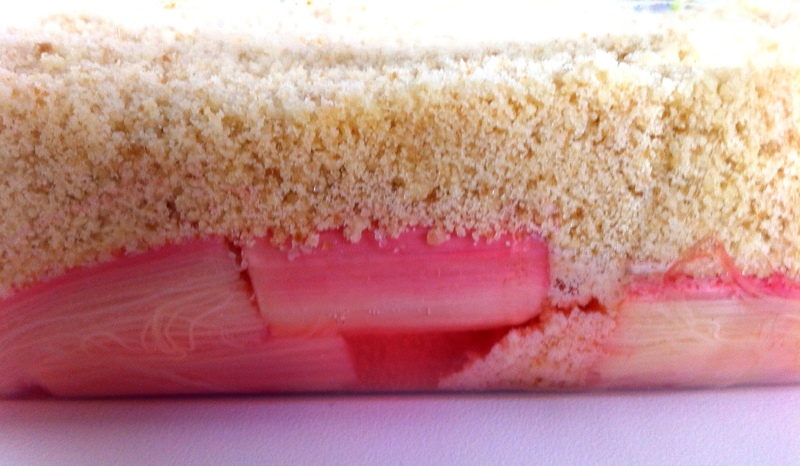 Allow the crumble to cool slightly before serving and the rhubarb will be really hot! I froze my crumble, so after step 1, I left the rhubarb cool completely and then covered with the crumble, covered with cling film and foil and popped it in the freezer. You can freeze for up to three months and cook from frozen for 50-55 minutes. With easy desserts like this, it is always best to double the quantities and prepare one for now and one for the freezer. 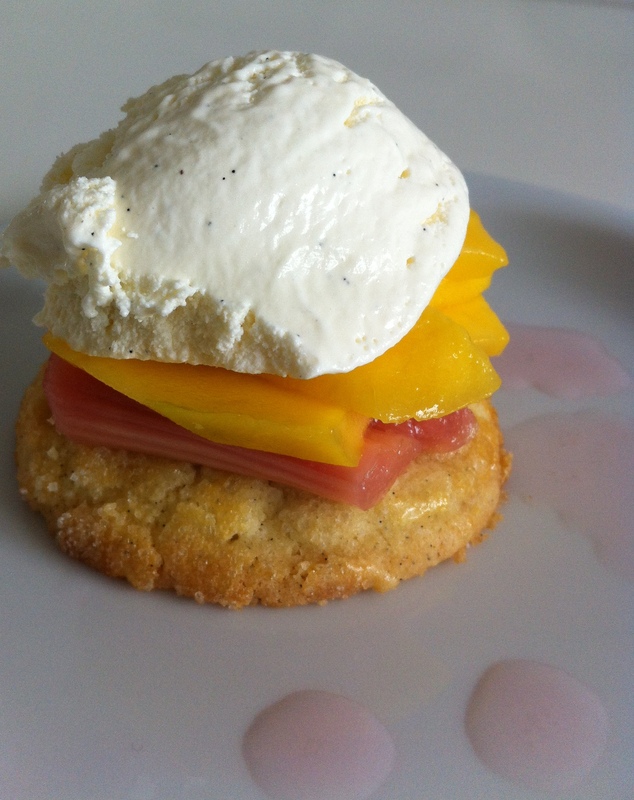 This one takes a bit more time to put together but the sable biscuits are worth the effort as they melt in the mouth, and topped with the poached rhubarb, fresh mango and a hit of vanilla ice cream, it makes a divine dessert. First make the paste for biscuits. Cut each vanilla pod lengthways and using the edge of a spoon gently scrape out the pulp. In a small bowl mix the vanilla paste with the two sugars. In a large mixing bowl mix the butter until creamy, add the salt and sugars and mix until light. Add one of the egg yolks and mix on a low speed and then gradually add the flour until just combined. Turn out onto a lightly floured surface and roll into two 9” logs and wrap in clingfilm and place in the fridge for at least three hours. Heat the oven to 180°C with the racks on the top and bottom thirds of the oven. Sprinkle the sanding sugar on a piece of greaseproof paper, remove the biscuit dough from the fridge, unwrap and brush with the 2nd beaten egg yolk and then roll in the sugar. Cut each log into ½” thick rounds and place on a baking sheet leaving 2” between each biscuit. Bake for 18-20 minutes rotating the trays halfway through. Remove from the oven when golden and leave to cool five minutes on the tray before moving to a cooling rack to cool completely. They can be stored for up to three days in an airtight container and there are more than you need but they will disappear very quickly). 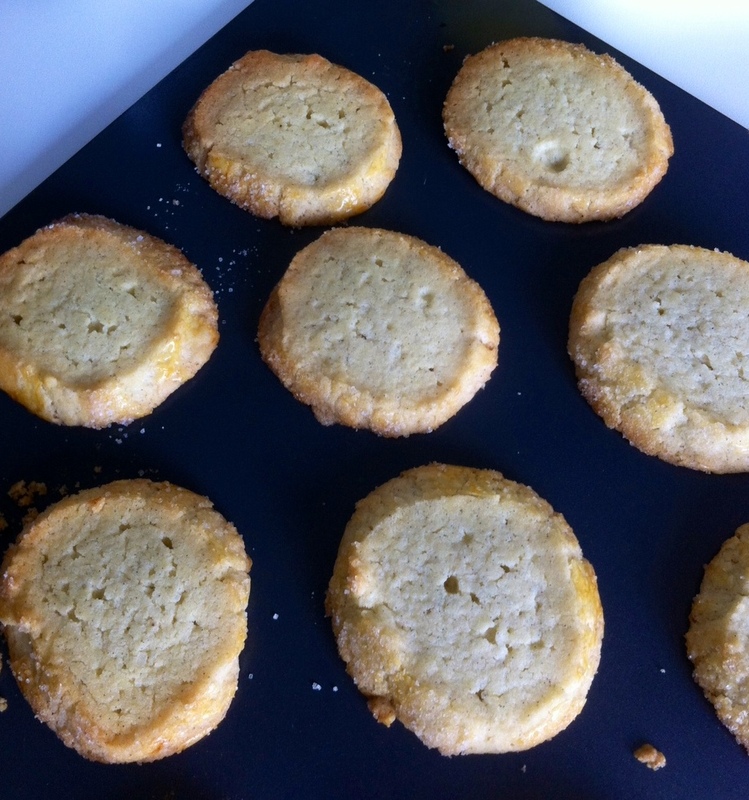 To serve: place a sable biscuit on each serving plate, use a metal ring to place the drained rhubarb on top, followed by the mango slices in a circular pattern. Remove the metal ring, top with vanilla ice cream and drizzle the plate with a little of the syrup.